Breakfast machines have a long Rube Goldberg heritage and have been featured in popular movies such as Chitty Chitty Bang Bang and Pee Wee’s Big Adventure. Rube Goldberg, Inc. is also proud to announce the official task sponsor for “Pour a Bowl of Cereal” will be General Mills, Inc. Since 1988, students from all over the world have celebrated the legacy of RUBE GOLDBERG® by creating RUBE GOLDBERG MACHINES ® in competitions which capture the spirit of the iconic American cartoonist whose invention cartoons celebrate innovation, persistence and imagination. With the rise of S.T.E.M., Rube Goldberg machines have become a fun and interactive way for teams to gain critical skills in these important educational areas. Every year a new task is assigned for the competition and participants at all levels create machines that can accomplish this task. The use of readily available, found materials is prized as is each machine’s narrative and sense of humor. 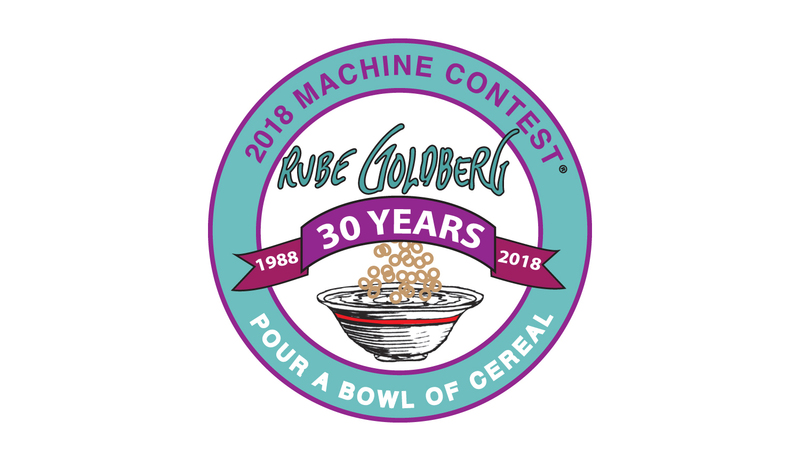 For this year’s task, contestants will build a RUBE GOLDBERG MACHINE ® per contest rules with the final step having the machine pour a bowl of cereal. Registration is now open for competing teams to enter the competition, which will culminate in the national finals this Spring.